Cubs first baseman Bryan LaHair singles in the only run of the game. Cubs pitcher Paul Maholm beats Atlanta 1-0. 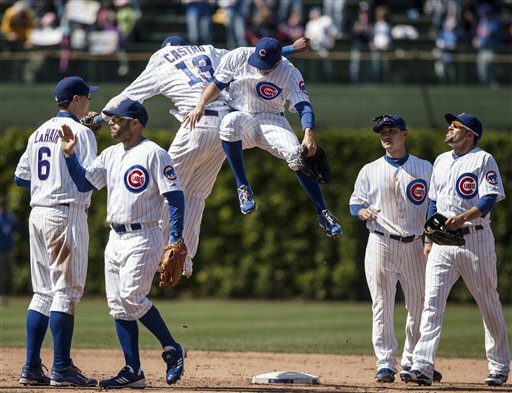 Cubs celebrate after taking 2 of 3 games from Atlanta. If you look at the baseball standings, you will find that the Cubs presently share the basement of the National League Central division with Milwaukee. You have to look past the standings to see some glimmer of hope. Some recent small victories could garner bigger dividends down the line: During this past homestand, the Cubs won back to back series against the L.A. Dodgers and the Atlanta Braves. Wednesday afternoon’s game was a joy for any baseball purist. Cubs starting pitcher, Paul Maholm, won his fourth straight game by blanking Atlanta 1-0. James Russell and closer Rafael Dolis helped preserve the shut out. (In the press box, it is always noted when a game is finished in just over 2 hours.) The coaching staff’s strategy with defensive shifts took away sure hits from the Braves. Using videos, technology and by moving his fielders, manager Dale Sveum said, “It gives pitcher’s extra outs.” That gives the pitcher the luxury of throwing to fewer batters. There are glaring problems, though, and two in the bullpen: Carlos Marmol and Kerry Wood. These guys were veterans the Cubs were counting on to help the young, inexperienced bullpen. Now, Marmol’s demotion as the closer may take a while to get straightened out. Manager Dale Sveum and pitching coach Chris Bosio have to figure how to convince Marmol to throw his fastball for strikes. He prefers his slider, not a good idea if that pitch doesn&apos;t get over the plate. For now, Marmol is a very expensive set-up man. Meanwhile, Wood’s health issues seem to have taken a toll on him. When he was relieved on the mound Tuesday night, he threw his hat and glove into the stands and his post-game media session ended abruptly, clearly showing his frustrations. Scoring runs and hitting home runs are still a big challenge-- just ask Ryan Dempster. On the positive side, given an opportunity to play, Bryan LaHair has hit in 27 straight games and leads this home run challenged team with 8 homers. The Cubs’ first baseman’s 7th inning RBI single was the difference in Wednesday’s win. He is definitely taking advantage of batting behind one of the league’s best young hitters, Starlin Castro. Also, LaHair is quite aware that the future first baseman in waiting, Anthony Rizzo, is tearing up Triple-A (he had 6 RBI on Tuesday). This weekend the Cubs hope they can improve on a 4-8 road record in Milwaukee. Dale Sveum is hoping his team continues to find more glimmers of hope in a season in which Cubs fans were not expecting too much. Follow Cheryl Raye Stout on Twitter at @CRayeStout.